I got some bad news from my mother. "Oh, mijo, I saw this GREAT movie on the Lifetime Movie Channel. It was a thriller about a serial killer and a woman who fought back." One can say that this description could fit just about ANY LMN production, to where even Mom commented that all they show is "thrillers". The Call would fit within the network's schedule to where one can wonder whether it was intended for cable/satellite broadcast and just found itself in theaters. The Call isn't terrible, and if it weren't for the final act which defies logic (or been a bit shorter) the film would have been the taut thriller it wanted to be. It is a bit of a wasted opportunity but the majority holds up very well, and can even be a bit exciting and tense. 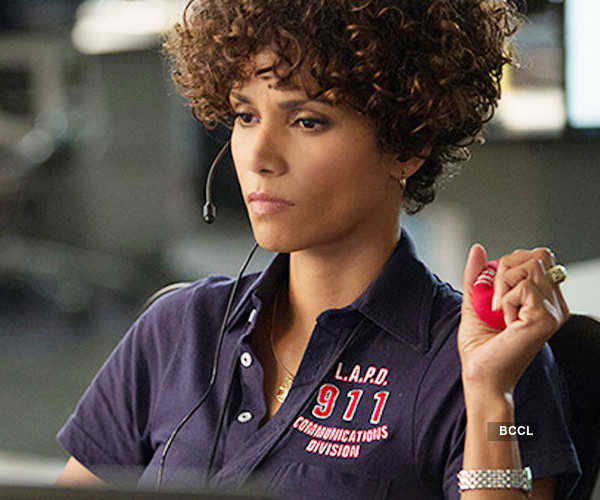 Jordan (Halle Berry) is a 911 call center employee, who takes all sorts of emergency and non-emergency calls. By what we see, she is a thorough professional who, well, enjoys is not the right word, at least has confidence in her abilities. However, this all comes apart when she gets a particular call. Someone has broken into the home of Leah Templeton (Evie Louise Thompson), a young girl. Leah calls 911, terrified of the intruder. Jordan at first handles this situation well: calming her down, contacting the police, giving her advise on hiding. Things appear to go well, until the call gets disconnected. In a split-second decision, Jordan hits the redial button. This has the tragic result of the intruder, who was about to leave, returning and finding Leah. Jordan tells him that the police are on their way and for him to not hurt Leah. "It's already done," he growls, before hanging up. A distraught Jordan falls apart, even more so when Leah's body is discovered a few days later. Not even her boyfriend, policeman Paul Phillips (Morris Chestnut) can comfort her. Move up six months. Jordan has now become a 911 operator instructor (whether she requested to be transferred or was moved for her own well-being or to get her out of the floor the film never answers). By what we see, she is a thorough professional who, well, enjoys is not the right word, at least has confidence in her abilities. As she is showing the trainees The Hive (the main call center floor) a trainee gets a very distressing phone call. We have been watching Casey Welson (Abigail Breslin) at the shopping mall with a friend. Her friend forgets one of her two cell phones, a disposable one. Casey holds on to it before leaving, but in the parking lot she is abducted. Terrified, she uses that phone (the abductor having taken her regular phone I think) and calls 911. The trainee is not up to the job, so in another split-second decision Jordan takes over. Most of The Call then follows Jordan and Casey as both struggle to keep in touch, jumping between Jordan's harried operator and Casey's efforts to be rescued. The abductor along the way meets innocent bystander Alan Denado (Michael Imperioli). Alan alerts him to paint leaking out of his trunk (which was Casey's attempt to attract attention), then when he checks in on the abductor the latter is forced to kill the former...and later kill him again. One of The Call's mistakes, but let's move on. Eventually through a lot of detective work on all sides we find the abductor's name: Michael Foster (Michael Eklund). However, at the end the trail goes cold, and when Jordan uses his name at the end of the call, he tells her, "It's already done." Shock: it's the same guy that killed Leah. Jordan won't accept she did all she could, and then while listening to the recording, she hears a distinct sound. Casey, meanwhile, is being tortured by Michael, and we learn why Leah and Casey were taken. Jordan manages to go to Foster's hideout, and rescues Casey, and both in turn enact revenge on their abductor. While watching The Call, I got a certain 80s vibe. I was justified in this due to not just the criminals selection of 80s music, particularly his interest in alternative music, or even in John Debney's score. The Call feels like something that could have come from the 1980s, a decent thriller that might have made a great, exciting thriller. However, by the end of The Call, when we have Jordan turn detective/action heroine AND have the women take a stand, it did devolve to Lifetime Movie material, which makes everything that had come before sink. It's this final third, when Jordan does what all people in films tend to do: go to the killer's house, alone, without weapons and without telling anyone, that The Call lost the impact it kept up through much of the film. For most of it, The Call was quite unnerving as Casey and Jordan on both ends attempted to end the crisis. Credit should be given to director Brad Anderson for how the controlled chaos of The Hive is captured, how difficult this job must be. The balance between Casey's desperate efforts to survive her ordeal and Jordan's efforts to provide both comfort and information is well-kept throughout the chase. However, Richard D'Ovidio's screenplay (from a story by Jon Bokenkamp and Richard & Nicole D'Ovidio) wanted to throw certain things at us. First was poor Imperioli, who was reduced to a bit of a cameo as the unfortunate bystander. As if that wasn't bad enough, why did he suddenly have to come alive when we think he's dead? I figure this was to try to give us a shock, but it was unnecessary, almost insulting. If you get an actor like Imperioli, it seems almost a shame to put him in a throwaway part. I can't say anything bad about Breslin, who was excellent as the tortured Casey. She was frightened and abused but also did make efforts to get out of her situation. I think Eklund did better in his role of mad abductor than what he was given on paper. His motivations were a little vague (was he scalping girls in some mad effort to bring his dead sister back to life?) but on the whole, he was asked to play crazy and he did just that. In regards to Berry, she can be good at times (the television specials Introducing Dorothy Dandridge and Queen for example), and in The Call, she gave a better performance than she has of late. Jordan's journey from guilt to second chance at redemption was well-played and more important, believable. Still, it wasn't until we got to the last part, where the women decided to take matters into their own hands, that I felt a terrible disappointment. If it had stayed with the police, or at least had Jordan take Phillips with him (or at least advise ANYONE where she was going), The Call could have been a taut thriller. For most of its running time, The Call is an exciting and tense film, and to see it falter near the end with a 'women's revenge' ending is a bit of a let-down.